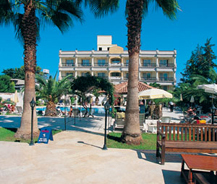 Pia Bella Hotel this is situated in Kyrenia, Northern Cyprus. This was a very small hotel few years back but now it is modified and extended its wings to have a great deal of repeated customers all over the time and always a busy hotel. Pia Bella Hotel offers customer care and service with great comfort level and the rooms are also decorated in a good manner to attract people. From this hotel many shopping centers and the local places are very nearby at a walking distance. Despite all these beaches is also very near such as just 3 miles from the hotel. As it is the only hotel which is near to both city and beaches it is preferred by many guests. Other than this the hotel has a garden at the backside which gives you a fresh breeze through out the day and also has an outdoor swimming pool with special section for children's. There is also a garden restaurant with A'la carte menu and traditional Cypriot cuisine. This has a total of 34 standard rooms and 2 suites with all necessary facilities with sea side view and also has 30 superior rooms designed to meet the high standards with balconies which enables the user to have a view of beautiful mountains.